Vacation rental cabin / bungalow. Sleeps 2, 1 bedroom, 1 bathroom. Dogs allowed. Living area with view of Salmon Lake. Dining area with view of Salmon Lake. 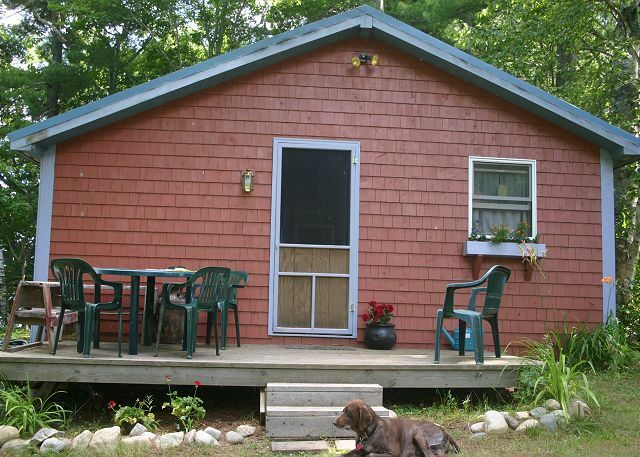 Nana's Camp is a cozy one bedroom, one bath camp located at the end of a private camp road on Salmon Lake. There is a family room with dining area, bedroom and one bath. Outdoors enjoy all the lake has to offer. There's a dock to swim and fish from & mooring for your boat. You can rest awhile in the lakeside swing. This is the perfect retreat for two. Gramp&#x2019;s camp a little heaven in Belgrade Oakland Area !!! What a nice little place the camp was nice and clean the stores around the area are not that far away we had perfect weather the only thing I would suggest is cut some tree limbs so you could see the view better of the lake from the camp other then that we loved it !!! BETTER THAN EXPECTED AND GREAT VALUE! This camp was very clean and had everything we needed! Beautiful lake frontage, great swimming and paddle boat. Cable TV was a plus, and got good reception on our cell phones. I'm planning to book for next year! The camp is adorable, and very secluded. Beautiful beach. Cabin was clean and neat. The dvd player does not work. Great little cabin for two people. Good dock facility other than very low water level this year, but that is not you fault. Only thing it needs is a covered porch so you can stay outside if the weather is not great. Cute little cottage in a peaceful setting (except the occasional loud speaker announcement from the summer camp next door, but that wasn't too bad and it really was very quiet otherwise). It was clean and had a few surprise amenities - AC in the bedroom, cable TV, ample dishes and pots and pans, paper products, etc. The pictures surprisingly do not show how close this is to the water, but it is. The water is quite shallow right in front of the property so it was a bit challenging for our boat (20 foot with 150 hp motor) but more than acceptable for swimming, especially with children. There were naturally lots of bugs with it being on the water, so more in the cottage as the days went on, so perhaps some property treatment would be helpful for us annoyed by little pesky insects. :) I would definitely recommend this rental to others! It was great.I showed up the first day and i was surprised how clean the cottage was and the yard as well. Had a wonderful time! The lake was beautiful and quiet. There were plenty of fish to catch and loons to watch. The cabin was cozy, tv was not so good, bring movies! Not much around the area to explore but still the scenery was breath taking. People in the local town were friendly. I vacation to Maine every summer and always have an amazing time. oh one con - only had half a roll of toilet paper so bring your own. Great little spot for couple getaway. and would make a much better view from the living room window. We look forward to going back for our anniversary!!! !